Emergency Alert, a telephone emergency warning system designed to warn people in life threatening emergencies, became a priority for the Victorian and Federal governments following the events of Black Saturday. The Victorian Government was asked by the Council of Australian Governments to take the lead in development of a public information campaign to educate and inform the public about the elements of the system following its official launch. A simple, educational and engaging approach that would register with a diverse audience. Messaging and imagery applicable to all hazards (fire, flood, cyclone, heat-wave) and relevant to all States. Clear scripting, to assist with translation into multiple languages and avoid risk of misinterpretation. Open caption TVCs for the hearing impaired. 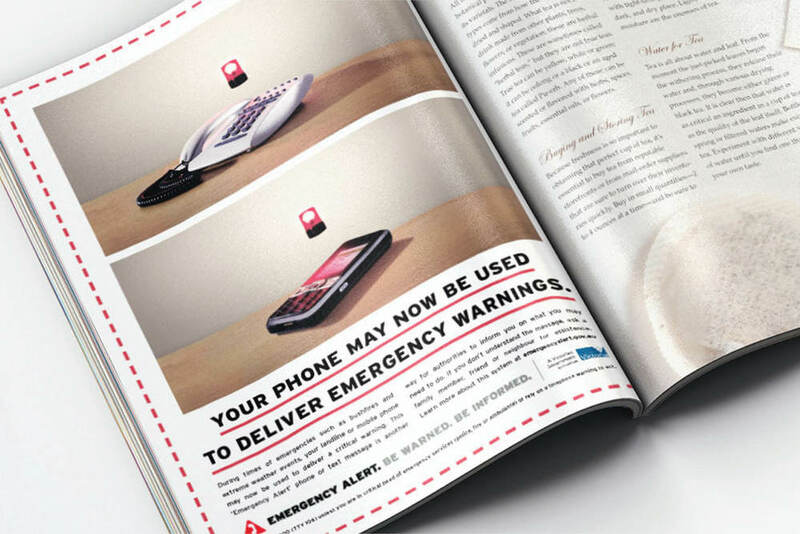 The launch campaign assisted communities across Australia to understand what the National Emergency Warning System is, how it works and what to expect should they receive a message, and comprised TVC, cinema, radio, print, online and CALD media. After roll out of the first wave of the campaign, awareness of the system increased significantly from 56% in the benchmark study to 77% of Victorians, with strong recall of important message elements. Key to this result was the simple, clear and instantly understood messaging and visuals, which were vital given the diversity of audience and seriousness of the message. The latest iteration of the campaign was undertaken in preparation for the 2013-14 fire season, promoting the upgraded capability of the system to deliver warnings to mobile phones based on current location.